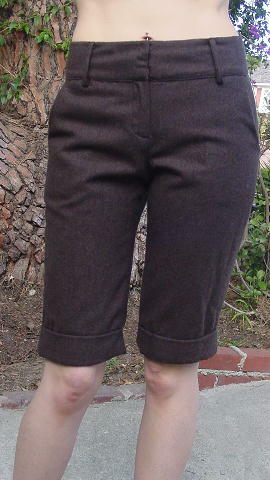 These multi-tone dark brown walking shorts are 80% wool and 20% polyester and are by Baby Tears. The very dark brown full lining is 100% polyester. They have a 3 1/4" long zipper fly, 2 5/8" wide waistband, belt loops, and a two large hook waist closure. The front has two diagonal pockets and there are 2" wide pant leg cuffs. The tag says size 3.